Douglas E. Christie, PhD received his B.S. from the University of California, Santa Cruz, his M.A. from Oxford University and his Ph.D. from the Graduate Theological Union, Berkeley and has been awarded fellowships from the Luce Foundation, the Lilly Foundation, and the NEH. His primary research interests focus on contemplative thought and practice in ancient and medieval Christianity and on spirituality and ecology. 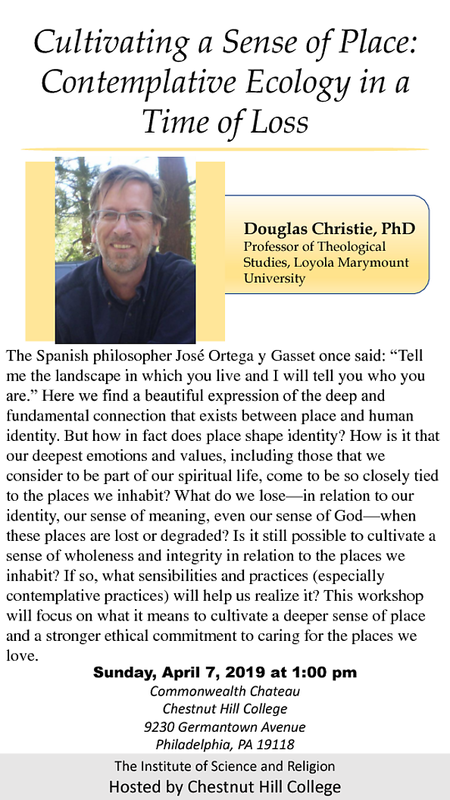 He is the author of The Word in The Desert: Scripture and the Quest for Holiness in Early Christian Monasticism, The Blue Sapphire of the Mind: Note for a Contemplative Ecology, and is the founding editor of Spiritus: A Journal of Christian Spirituality. His current work is focused on the idea of mystical darkness and the contemporary sense of exile, loss and emptiness. Come join us at 1pm on April 7th! Free Will Donations are accepted and very much appreciated.